As the sun rises over the valley, a warm glow reflects off a thick layer of haze, transforming the already beautiful landscape into an ethereal scene. A brilliant expanse of glistening greenery appears, visible as far as the eye can see. Massive grassy mogotes (steep, dome-like limestone hills) dot the otherwise flat valley in a scene reminiscent of Jurassic Park. Birds converse cheerily as life stirs in the quaint farming town below. A new day has begun in Viñales. Less than a 3-hour drive west of Havana, Viñales has served as a sort of Eden dating back to before modern civilization. It has rich, fertile soil and a good climate for farming. Viñales is also home to Cuba’s largest natural cave system. These caves provided shelter, at different points throughout history, to the island’s native Taino population, to newly-arrived Spanish colonists, and to runaway slaves. Today, visitors to Viñales can take a boat tour through the caves. Floating along a dimly-lit stream, listening to the echoes of cold water dripping off stalactites, they can admire the murals and relics left behind by a unique cultural blend of island inhabitants. The arrival of the Spanish brought large-scale tobacco farming to the Viñales Valley, and with the perfect climate and soil conditions, the area became a hub for the international tobacco industry. Viñales was officially established as a town in the mid-1870s but didn’t gain national prominence until 1882 when the Western Railroad built a Viñales stop to split the distance between the main town in the area, Pinar del Rio, and the main port, Puerto Esperanza. Today, downtown Viñales embodies a naturally sleepy and familiar small-town mood, making it the perfect getaway. Wide streets and low buildings in the central plaza provide a spacious atmosphere. Here visitors can sip mojitos at a corner cafe and bask in the midday sun. The pace of life is slower and more intimate, providing travelers some respite from Havana’s hustle and bustle. Guajiros (Cuban cowboys) lounge in rickety sillones (rocking chairs), puffing on fresh-rolled cigars as they watch travelers wander the roads. Strike up a conversation with one of them, and chances are you will find yourself trotting on horseback toward the outskirts of town, bathed in sunlight and leaving rust-colored clouds of dirt in your wake. The valley’s geography, coupled with the climate on the western side of the island, produce abundantly fertile fields. This made Cuba the birthplace of the cigar, and the Viñales Valley its beating heart. 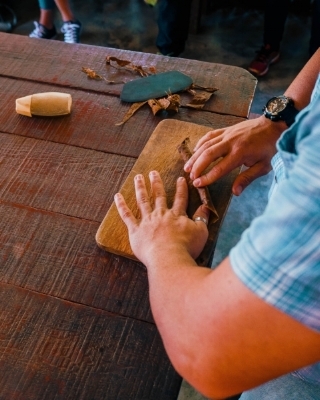 Tobacco farmers here use the same traditional methods of cultivation that Cuban cigar makers have been using since the very beginning, ensuring each cigar is of the utmost quality. On an exclusive tour of a multi-generational tobacco farm, CUBA CANDELA travelers can partake in this time-honored tradition and experience every step of the process. From the rows of fledgling tobacco plants rooted in the ruddy soil to the rows of wrinkled tobacco leaves hanging from the roof of the curing house, the cigar-making process is entirely un-mechanized. Visitors learn secret family techniques for hand-rolling cigars with a twist, and once puffing on one of these, they may never leave. However, tobacco farming is not the valley’s only agricultural draw. After the fall of the Soviet Union, Cuban farmers adopted sustainable, organic farming practices. 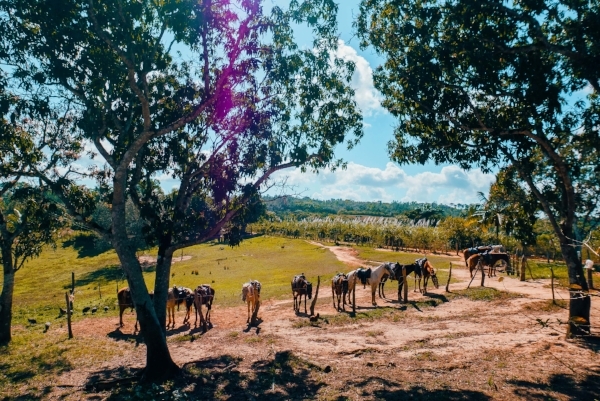 Today, as the farm-to-table trend takes the world by storm, Viñales’ sustainable agricultural practices have catapulted the area to global prominence once again. Until the fall of the Soviet Union, sugar had been Cuba’s principal export, and sprawling sugar plantations required excessive use of pesticides and other pollutants. Without chemical resources from abroad, Cuban farmers re-adopted age-old methods of land cultivation. They established smaller plots that could be plowed by oxen and required no pesticides, and shifted to more localized distribution methods, becoming an international forerunner in sustainable agriculture. 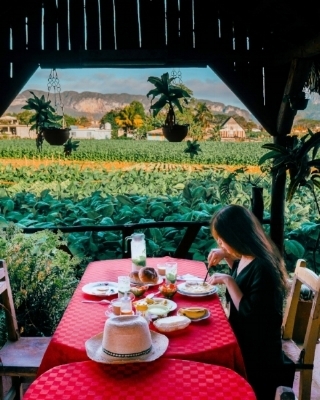 During a trip to one of Viñales’ sustainable farms, travelers can revel in the knowledge that every bite of food (with the exception of the fish!) originates from the farm itself. “Farm fresh” takes on a new meaning for guests as steaming cuts of fire-roasted pork belly fall directly from the spit onto their plates while they snack on vegetables harvested from the soil beneath their feet. After the meal, visitors can digest while lounging in rocking chairs, steaming cafecitos in hand, and listen to rambling tales flow from the cigar-worn voices of weathered farmers. As dusk approaches, the valley undergoes another ethereal transformation. Gentle dust clouds kicked into the air by horse hooves create a golden haze as adventurers ascend overgrown hills towards CUBA CANDELA’s special viewing point. Here, perched atop prehistoric slabs of limestone rock, gazing upon the valley framed by richly-hued foliage, they are treated to a view as serene as it is surreal. Fields alternating every shade of green imaginable are dotted by clusters of glistening palm trees and towering limestone mogotes. Beneath it all, the earth’s red undertones lend a sense of warmth to the view while wispy clouds hover above the ground as if fallen from the sky. As the sun sets on the golden hour, the fanatic chirping of crickets fades away as if all life on earth is simultaneously enraptured by the sunset’s beauty. For a brief moment, everything falls silent—some say this is the point where heaven meets earth.